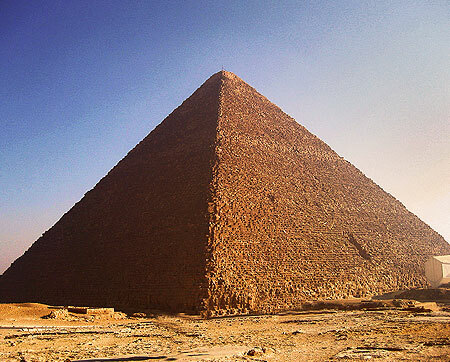 When the Great Pyramid of Egypt was built it was 146 meters (480 feet) tall. Time has worn the pyramid down to 138 meters (455.4 feet) and it still continues to erode. The pyramid was once covered with limestone that was polished and believed to be left white. The sides of the pyramid are carefully positioned to point north, south, east, and west. 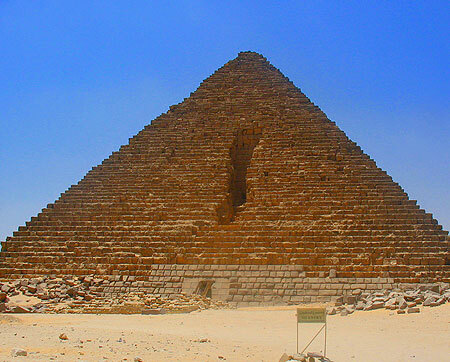 The base of the pyramid has sides that measure 230.4 meters (755.9 feet) in length. It was designed so accurately, that the error of margin between the sides is less than 1 percent. The Great Pyramid is made up of approximately two million blocks of limestone and slopes upward 51 °. 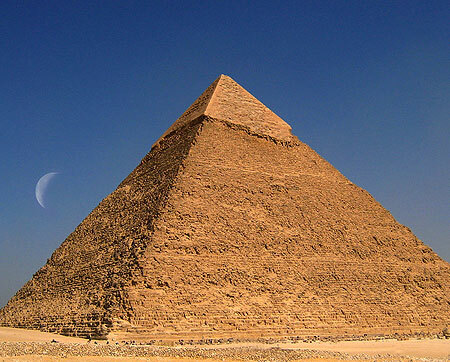 Each block used to construct the pyramid is estimated to weigh more than two tons. It belonged to the pharaoh Khufu and once held his body; however, today the pyramid remains empty. The Great Pyramid is considered the last ancient wonder of the world standing today. The second pyramid belongs to the pharaoh Khafre. Unlike the pyramid of Khufu, the angle of this pyramid is 53 ° and the pyramid stands 148.5 meters (470.5 feet) tall. This pyramid is 10 meters shorter than Khufu’s, though appears to be larger due to the height of the bedrock and stands on the northern side of the Giza Plateau. The top of this pyramid has a smooth limestone cap also giving it the illusion of being larger than Khufu’s pyramid too. Like Khufu’s pyramid, this tomb was also looted. The pyramid of Menkaure, or the third pyramid, is the smallest of the three pyramids. Its design is not as well detailed as the other two pyramids or is it as massive. Today it stands 66.5 meters (218 feet) and has an angle of 51 °. The base of this smaller pyramid is 108.5 meters (355.9 feet). The pyramid was not complete when Menkaure died so his son Shepseskaf took the task of finishing the project. These pyramids may appear to be alone on the Giza Plateau but are not. There are many other structures that surround these massive tombs such boat pits, queens’ pyramids, mortuary temples, valley temples, mastabas, and the sphinx.